Mod: I'm trying to help you out here. This is important, and you need to pay attention. 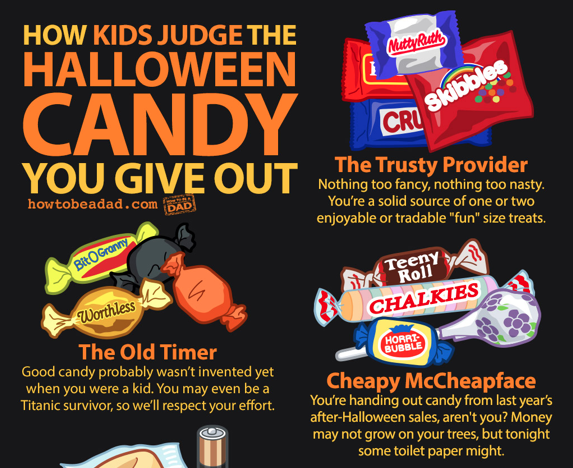 Guide to How Kids Judge Your Halloween Candy (HowToBeADad.com link): Everyone has their varying candy preferences, but sizing up what’s been plopped into the bag is a pretty universal part of Halloween. However grateful and well-mannered they are, it’s impossible for trick-or-treaters to avoid casting some judgement on the treat-giver-outers they encounter. You see, parents don’t often let kids eat the entire bag in one sitting, so kids have to prioritize what they’ll eat first (or sneak-eat between houses, under the cover of darkness). Valuations need to be made for some potentially cutthroat trading later. And then there’s the parent tax, though this is usually easy since adults crave a lot of candy kids would rather use as a skipping stone than eat. There’s a lot of complexity to it all. This is really serious stuff, man! I mean… for kids. (ehem) Heh. You can’t really go wrong. If kids don’t like Smarties, they can always swap them with a friend that likes to chew on sidewalk chalk. 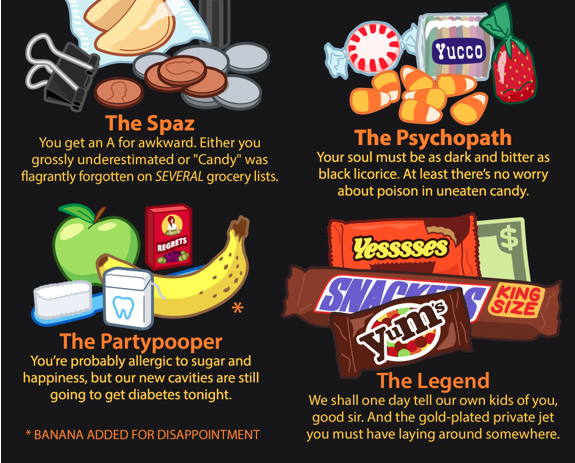 Okay wait, maybe the Partypooper “treats” are a way to definitely go wrong. Just turn off your porch light and lock your door if you hate kids and tooth decay so much. Let's remember Halloween 2017 as the first time it feels like the scary swamp actually has a chance of draining a little bit!!! OOOOOOwwwwwweeeeeeeee!!!! When conservative commentator and host Rush Limbaugh opened his radio show Monday, indictments had just been made public in Washington D.C. against President Trump's former campaign chairman Paul Manafort. Manfort and one of his top lieutenants had been taken into custody on charges of money laundering and tax evasion. Special counsel Robert Mueller had also secured a guilty plea from former Trump campaign aide George Papadopoulos, who admitted to lying to the FBI about contacts with Russia. But Limbaugh, one of the most influential voices on the right, worked quickly to reframe the day's developments. "None of this is real," he insisted. When a listener suggested Mueller had "gone rogue" and might be trying to topple Trump, Limbaugh amplified the fear. "This is the coup. If Hillary had been elected, none of this would be happening, other than they still put Trump in jail as a message to the outsider, don't dare try this." Much of Monday's conservative coverage asserted that Clinton is actually the one who colluded with Russia when she was secretary of state. Fox News star Sean Hannity told his audience that people investigating Trump are all complicit in an Obama administration decision in 2010 that allowed a Russian company to gain a financial interest in part of America's uranium reserves. Fact-checkers with the Washington Post and other outlets have looked at these narratives involving Clinton and found they don't check out. Nor do these claims have anything to do with Monday's indictments or the question of whether Donald Trump's campaign colluded with Russia during the 2016 election. Manafort faces 30 years in jail. He is 70 now. With Limbaugh it's difficult to tell if his neurons are misfiring or they're bathed in oxy. I saw on the news that the Pope is worried about a nuclear destruction of the planet because of Trump. Yet, he still has people who approve of his actions. The sooner he gets impeached and goes to jail the better. Limbaugh is basically a mouthpiece for the Putin regime these days. Interesting that those who scream "patriotism!" the loudest are actually this country's worst traitors since Benedict Arnold. What is happening with our government now is far scarier than anything Halloween has come up with. If Trump is arrested will he be tried as an adult? Lol. Thanks Mod, it's good to laugh. Enjoyed your "sizing" up the day. PPP’s newest national poll finds a record level of support for impeaching Donald Trump. 49% of voters support impeaching him, to 41% who are opposed to doing so. This marks the 6th month in a row we’ve found a plurality of voters in favor of impeaching Trump, and it’s the closest we’ve found to a majority. TRICK or TREAT: The investigation was about the election and Russia. Nothing about Manafort's real estate dealings over twenty years has to do with the election, Russia or President Trump. That's how I size up this sweet deal that Mueller has made after one year of investigations. Patience, buttercup. The fun has just begun. The ship is just beginning to take on water, and the rats are already in a frenzy with no way to escape. OK What about the Cheeseburger icon? Now that is important stuff. You say the "investigation was about the election and russia" It still is,it ain't over 'till the fat lady (or in this case man) sings. Didn’t you want to drain the swamp? In the case of the Trump White House it is more like flushing the pot. First pass the candy through a metal detector then through a CAT scan machine then it's off to a explosive dissector then for the last stop the drug sniffing dogs test, trick or treat 2017. Stay home with your gun and the lights out please. Ah havta cuz peeple bin walkin on mah lawn. Was curious how many lighthearted comments would survive before things devolved. That would be zero (save for 8:15, who went ahead and threw one in among the junk). knowing that you won't sing along. I'll sing a song, knowing the treat of a new tax plan roll out is coming along. Party with my own money that I will get to keep. 10:57 thinks everyone else should pay his debts. "Terrorism until proved otherwise", NYC confirms several dead, struck by van on bike path near the World Trade Center. Happened on Trump's watch. Lock him up. I’m ten blocks away from the incident. Cops everwhere. Was road rage. How do you imprison a watch? Candy is dandy, but I really crave a couple more nothingburgers! Then keep watching Fox. Big old steady diet of nothing. Can I get a fugazi amen!?!? 1:40pm. Obama gave us ( the World) ISIS. it is a lack of chromosomes on the strands of DNA; yours and theirs, it keeps the hate alive. The GOP gave us Osama bin Laden. Republicans are anti American- Regan was the loser who gave us osama. Bush 2 was the loser who gave us abu ghraib, bs patriot act, blackwater and Isis. 4:24pm. Ahh no, that was President B. Clinton, check your history. Be careful out there when you go gathering treats, steer clear of the tricks. 9-11 happened on Bush's watch, you clown. If you want to have no kids come to your house on Halloween, move to Arcadia. The present Asian majority doesn’t let their kids participate in such heinous activities. You could have your kids dress as the Fantastic 4.